The DVD and Blu-ray are subtitled in English, German and Danish. The discs are Region Free and in the UK/Australia PAL format. 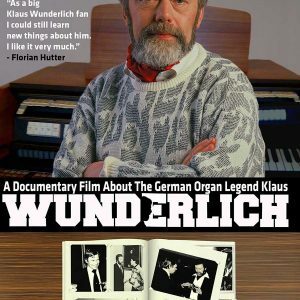 On 28th October 1997 Klaus Wunderlich passed away aged 66, now twenty years later (and perfectly delivered… to the day) a new documentary has been released that explores the life and career of this German organ maestro. I first heard about this documentary a couple of years ago, but I think there was a bit of a struggle getting it off the ground, hence the wait. However, it’s finally arrived on DVD and Blu-ray and the delay means it can be released to commemorate the anniversary, which seems fitting. The documentary is a pretty professional looking affair too, the presenter and interviewer is Danish Wunderlich-fan Jesper Bonde Hansen who is also the director (and a keen bow-tie wearer). The video is narrated by fellow Dane Claus Lund who joins Jesper on an epic 2,000 mile trip from Denmark to the UK and Germany. Jesper interviews various people who crossed paths with Klaus, from his first trips to the UK and throughout his illustrious career, it also touches on his private life away from the stage. The duo’s first stop is Cornwall and the home of Alan Ashton and his wife Dorothy (after they noticed Alan’s ORGAN1st Radio Show and Klaus website online). Alan talks about Klaus’ fondness for the piano at school when he was a rehearsal pianist, his early meetings and Alan’s love of the first LP he bought, “Hammond Concerto”. 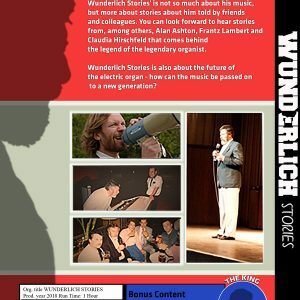 We later get a brief look at his LP collection, which helped to produce his discography and now the KlausWunderlich.com website. 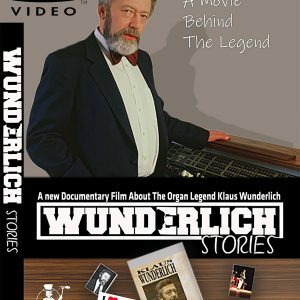 The documentary takes us to Germany and outside of Klaus’s old house where he lived from 1972 to 1980 as well as a quick trip to see one of his old Studer reel to reel tape machines which is part of a collection of old radios and phonographs. There are interviews with Andreas Mautner who is the Editor of the OKEY magazine in Germany as well as being married to fellow organist Claudia Hirschfeld who shares her memories of her less than affable dealings with Klaus. Dorothy Ashton (née Timperley) talks about her first contact with Klaus and being asked to set up the Klaus Wunderlich Appreciation Society (at his request). She later passed the reigns of the Society to John & Shirley Mutton who are also interviewed. Klaus asked for the Society to be closed in 1995, just a couple of years before his death. There are some light hearted interviews with top organists Franz Lambert, Ole Erling and Brett Wales who recall the scantily clad models on his LP covers (which you can see on Alan’s website). This seems to be the reason many people found their love of half-naked women (…Sorry, organ music). There are other stories of his punctuality when he would wait to the exact minute before he went on stage and would finish bang on time too. Alan Ashton and Brett share some of the stories of his sometimes funny, sometimes frosty encounters with his fans. His lesser-known spiritual trips to India, Hindu rituals and the German religious book he published in 1980 are also touched upon by friends including fellow musicians Mark Whale and Hady Wolff. Florian Hutter and the thirteen organs in his basement also make an (all too brief) appearance, as does the Danish bus driver who plays Klaus’ music to his passengers, seemingly whether they like it or not (or whether they want to walk home or not), although most seem to conform and smile nicely at the driver. 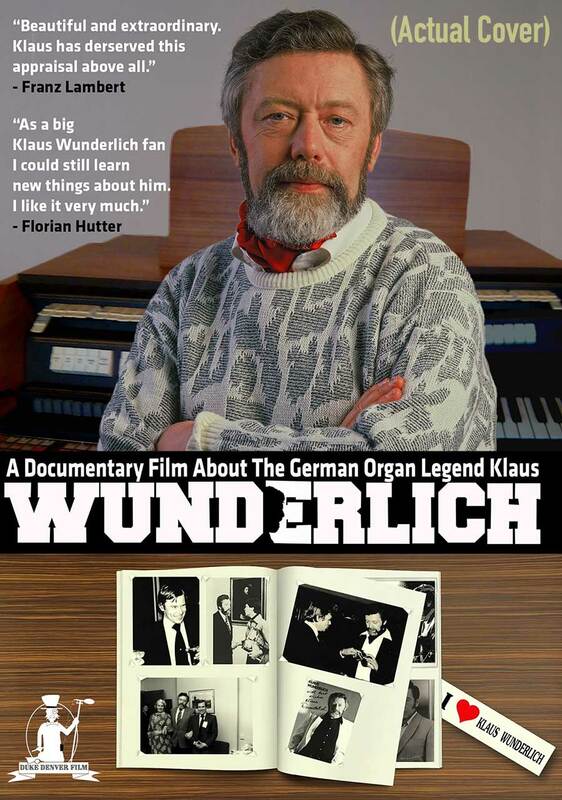 I should mention that, while the whole documentary is set against a subtle backdrop of Klaus’ music, there is not a great deal of video footage of Klaus actually playing. There are clips from his first BBC appearance on Pebble Mill in 1978 and again in 1984, as well as video of him at London’s Penta Hotel in 1977 (although this was Dorothy Timperley’s Cine film, so sadly no sound) and a some other interesting snippets. 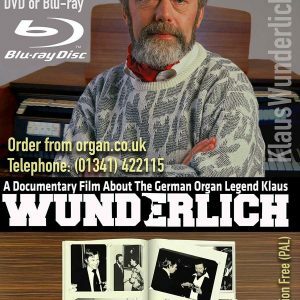 The main views of Klaus are from the scattering of rare photographs throughout the interviews and narration, many of which are from Alan & Dorothy’s collection. Some of these photos have been enhanced with neat video trickery which even make some of his selected body parts move! While I do think this documentary is done well, it is let down by the subtitles as they haven’t been added as most DVDs would, with English ones added to the foreign speaking contributors. If you want to know what Franz Lambert, Hady Wolff and a few others are saying, the only option is to have the English subtitles turned on throughout the whole thing (Andreas Mautner and Claudia Hirschfeld do speak in English, thankfully). I know it’s a Danish DVD, but it seems to be aimed at English speakers (as Jesper and Claus both talk in English and the captions are in English), so these subtitles should have been done as an option (as with the other languages). They also look a little jagged and I did spot quite a few typographical and grammatical errors. 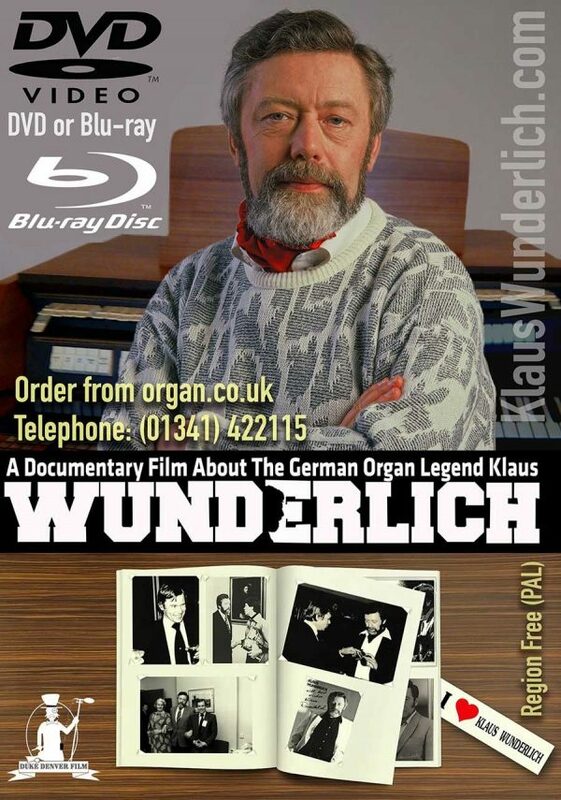 That aside, this is a very interesting film charting the highs and lows of Klaus’ career from his sell-out concert at The Royal Albert Hall in 1978 (to seven-thousand people) to the slow decline of organ LP sales in the 1980s. The shock news of his death in 1997 and its lack of reporting, even in Germany, are also covered which is a sad end for an artist who sold twenty-million records. The documentary may have been made from a fans perspective, but it’s not all sugar coated and it does a pretty decent job of getting to the heart of this extremely talented but complicated man.